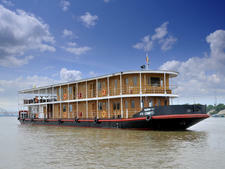 The beauty of the Upper Mekong, which runs through Laos and into China, is a simple one. Misty mountains covered in green surround the river, so full of boulders and sandbar hazards that your boat must sail in a crisscross fashion to avoid an accident. Fishermen in longboats, hailing from the remote villages where Laos' hillside tribes live, are the only other vessels sharing the waterway. 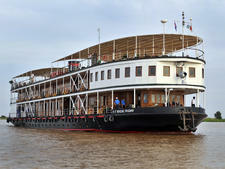 Interesting excursions, comfortable cabins, personable local guides and staff. Extensive sailing time might be dull for some; itineraries dependent on water levels. 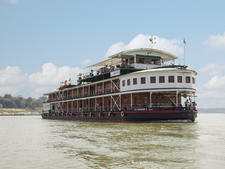 One of few vessels plying the Upper Mekong; a comfy base for exploring remote Laos. 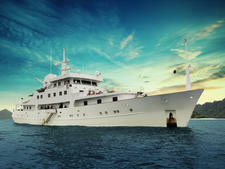 Cruising there is a quiet experience, focused on culture and education rather than big-ticket attractions. 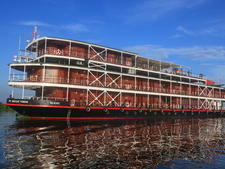 And Champa Pandaw, built in 2016 specifically for the Upper Mekong, fits right into the surroundings. 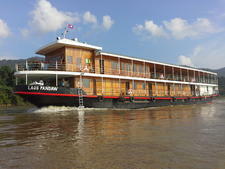 Designed in the style of a colonial riverboat, Champa Pandaw is a study in teak; the light-colored wood, which grows along the Upper Mekong, is used throughout the boat's cabins and public spaces. The effect is that the vessel blends into its surroundings in a clean and natural way, without any ostentation. 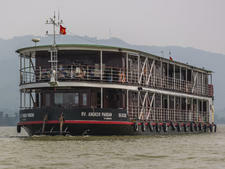 Still, cruising is relatively new to the Upper Mekong. 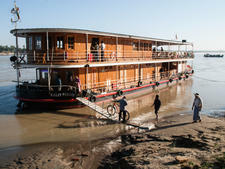 Pandaw is the only cruise line to sail that section of the river, and when Champa Pandaw makes a stop and the crew use their shovels to dig makeshift stairs in the sand for passengers to disembark, the process draws a crowd. Children stand on the banks, daring each other to approach. Adults stop their weaving or agricultural work to say hello. Excursions on Champa Pandaw consist mainly of walks through the villages. The boat's Laotian guide explains what makes one ethnic group different from another in terms of customs and spiritual beliefs. Stops at schools are a highlight, as classes break to say hello. Younger children follow the tour group through the village in a noisy entourage. Dogs, pigs, chickens and water buffalo wander between homes. While the poverty can be heartbreaking at times, your Pandaw guide will give you plenty of context so you can process what you're seeing. Your education continues on the boat itself. Meals are heavy on flavors from the area, with Asian dishes dominating the menu. Lao language lessons give you the basics so you can interact with people on shore. Lectures, documentaries and cultural performances are the main programming. Even Pandaw special activities, such as a Sandbar Cocktail Hour and a Buddhist boat blessing, have educational overtones. The all-local staff make onboard time feel special and authentic. It might all be too quiet for some, however. 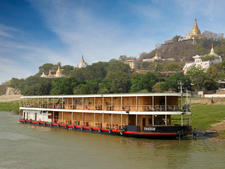 While the itinerary builds in three days in both the UNESCO World Heritage Site of Luang Prabang and the country's capital Vientiane, long stretches of time are spent sailing. Wi-Fi is spotty or nonexistent, and there's no TV onboard. 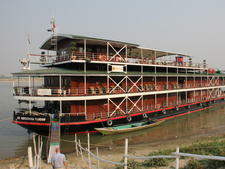 At the max, Champa Pandaw carries only 28 passengers; on our sailing, the boat was half full, so there's no way to hide in a crowd. 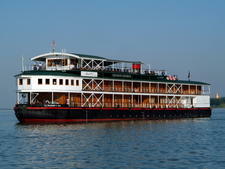 A cruise on Champa Pandaw is best suited for those who are comfortable entertaining themselves with books or casual conversation. This mellow atmosphere suits most cruisers, the majority of whom have sailed with Pandaw before. For those who want to dig deep into a country that's not particularly well known, Champa Pandaw offers a comfortable base for cultural exploration. Champa Pandaw's passengers are well traveled and come from around the world. Most have traveled extensively in the region before, as Laos is not a first-time-in-Asia destination. On our 10-night itinerary, people hailed mostly from Australia, with one couple from the U.K. and three Americans. The demographic is squarely baby boomer; most passengers are in their 60s and 70s. Because Pandaw offers many departures without a single supplement, there are usually several people traveling by themselves on any particular sailing. 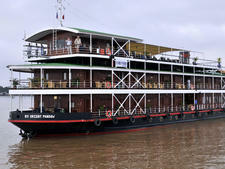 Pandaw enjoys a high repeat rate, and on the more remote Upper Mekong itineraries, almost 80 percent of the passengers have sailed with the line before. English is the primary language of the ship. Passengers should be physically fit enough to negotiate climbing the muddy riverbanks and the often uneven stairs and terrain found in Laos and Thailand. The ship is extremely casual, with shorts and T-shirts acceptable not only during the hot and humid days but in the evenings too. Women will want to bring a few pairs of capris or skirts that cover their knees for temple visits, as well as shirts that cover the shoulders. Temple socks are handy, too, as are shoes or sandals that are easy to slip on and off. Alternatively, you'll want another sturdy pair of closed-toe shoes for walking up riverbanks and through villages. (Boat staff take your shoes at the end of each excursion and return them to your room after cleaning.) Sun hats for daytime are recommended for both men and women. A raincoat can come in handy at the end of the wet season, while long-sleeve shirts protect against insects and also help you keep warm in the mountains during the winter months. 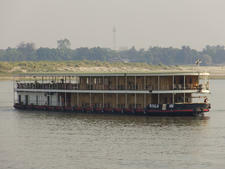 The boat provides umbrellas, which can be used for both rain and excessive sun. 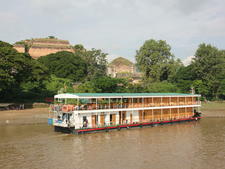 Pandaw is mostly inclusive, and your fare covers entrance fees, shore excursions, tips and transfers. Soft drinks, local beers and spirits, mineral water, coffee and tea are free. A cocktail of the day is also served during happy hour. 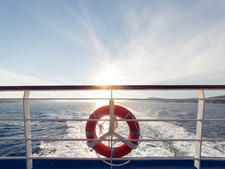 Gratuities for the ship staff are also included in the fare, but a tip for your guide is not. Pandaw does not give a recommendation, but we tipped about $25 per person. Pandaw "members" -- essentially anyone who has traveled with the cruise line before -- receive a house wine package, which gives you a choice of five or six wines at lunch and dinner. Members also receive $50 worth of laundry service and reduced fares. Wine, cocktails, premium liquor, laundry service, visa fees and gift shop items are priced in U.S. dollars, and bills are payable at the end of the cruise by cash or credit card (Visa and MasterCard only).